Explain what causes the excessive arcing at the switch contacts, and how the presence of a diode in the circuit completely eliminates it. The arcing is caused by inductive "kickback," and the diode prevents it by providing a complete circuit for the inductor's current to discharge through when the switch opens. This question provides an excellent opportunity to review inductor theory, particularly the direction of current and the polarity of voltage for an inductor when charging versus when discharging. Analysis of this circuit will be made easier by drawing a schematic diagram. What will an ammeter (with an input resistance of 0.5 W) register when connected in parallel with the diode in this circuit? 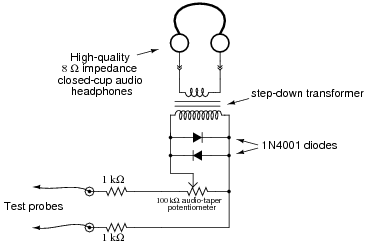 Usually, ammeters are connected in series with the component whose current is to be measured. However, in this case a parallel connection is acceptable. Explain why, and determine the ammeter's current reading in this circuit. The ammeter will register a current of 4 mA. A very important point to ask your students is how they figured out the meter's indication. What circuit analysis technique did they use, and why? Emphasize solving this problem without using a calculator to do the math. Are your students able to determine the result by estimation alone? Does the input resistance factor into the calculation significantly? The only problem with this scenario is the possibility of one of these power sources internally short-circuiting. Describe what would happen if one of the three DC power sources developed an internal short-circuit, and explain how this problem could be avoided by placing diodes in the circuit. Challenge question: it would be nice if there were indicator lamps in the system to warn maintenance personnel of a shorted power supply. Is there any way you can think of to place light bulbs in this system somewhere, so that one will light up in the event of a power supply failure? Discuss both the nature of the problem, and of the solution, with your students. Why does the proposed solution work to eliminate power failure in the event of a short-circuit internal to one of the power sources? With a diode in place, the release time for the solenoid increases measurably. In other words, it takes longer for the solenoid to completely de-magnetize after the switch contacts open, than if there is no diode in the circuit. 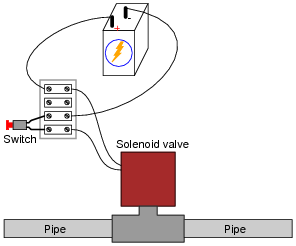 Explain why this is, and also propose a solution for the minimizing the solenoid's release time. The presence of a commutating diode increases the solenoid's release time because the L/R time constant of the de-energizing circuit is made much longer than with no diode in place. The solution to this problem is to decrease the L/R time constant of the discharge circuit (I'll let you figure out how!). This question is an good review of inductor time constant theory, and challenges students to put their mastery of L/R time constant circuits to the test by engineering a solution for this problem. Once a solution has been agreed upon, ask your students if the solution introduces (or re-introduces, as the case may be) any other problems in the circuit.